These lil suckers are Buckeye Delights. And I mean they are D E L I G H T F U L !!! Chocolate sugar cookie, peanut butter and chocolate frosting. What’s NOT to love?!?! First I lined mini muffin tins with paper liners. I used two different designs of papers because I didn’t have enough of one kind in this size. And that hurt. I love to match everything and now the papers are mismatched like a bad pair of socks. I mixed up the cocoa-ified sugar cookie dough and pressed into the bottom of the paper liner and made a thumbprint in them. Then came the best part: the peanut butter dough ball in the middle! I may have stuffed a few of these bad boys right in to my mouth as I was making them to go in the cooked cookie cups. But who’s counting? These buckeyes are similar to the ones I featured here. And then comes the chocolate frosting on top. Like a cherry on top, but even better! Sadly the frosting I was making never thickened enough to spread on top, but luckily I had premade whipped chocolate frosting in the fridge that I used instead. And the last step is mixing chocolate and peanut butter in a baggie and making cute swirly marks on top of the buckeye delight. Heat oven to 350°F. 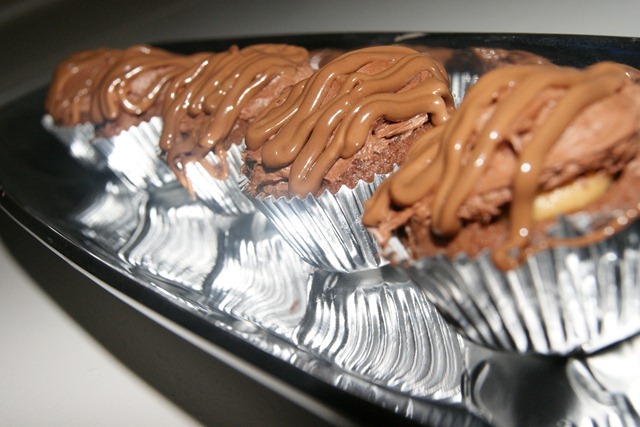 Line 36 mini muffin cups with mini foil candy cups (about 1 1/4 inch). In large bowl, stir cookie base ingredients until dough forms. 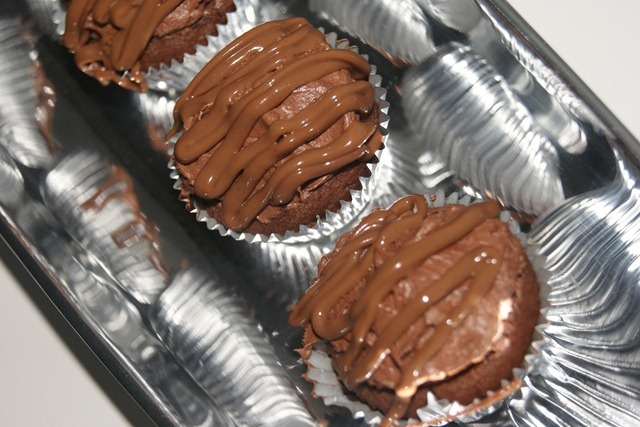 Press about 1 tablespoon dough into each foil cup. Bake 8 to 9 minutes or until puffy and set. Cool completely, about 30 minutes. Remove from pan. Thanks to Betty Crocker for the recipe 🙂 And thanks to my work friend Amy for introducing me to this magnificant treat! Don’t pass by these treats after reading this post! They are screaming at you and they want in your belly! 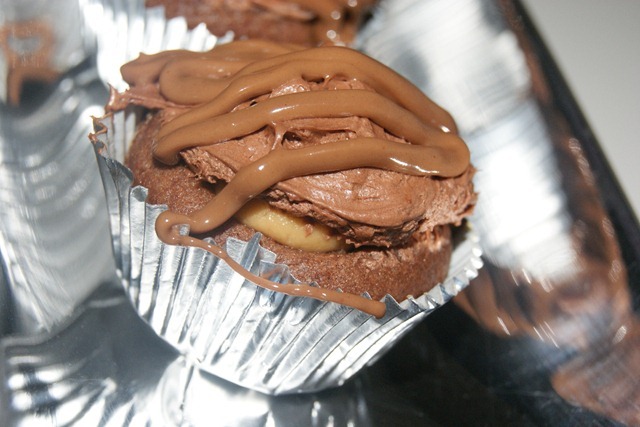 This entry was posted in Deliciousness and tagged chocolate, Peanut butter, Sugar cookie. Bookmark the permalink. I’m not disappointed just looking at them. Holy Moly those look fantastic. umm….cupcake post? I officially love your blog! I want one…now! This is what I would say to one before I ate it: Hello Lover! I love peanut butter and chocolate together. I wish that I loved nut butters on their own, but nope, love them in chocolate only. 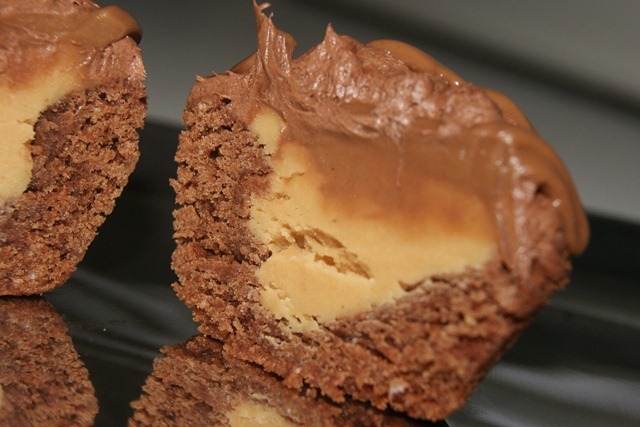 Oh Angela, since you love PB and chocolate together, you’ve got to make these! I was thinking they’d be good for people from Ohio! ha! Have fun! oh man do these look decadently good!!! delicious! These look dangerously delicious! perhaps make for the next party? Definitely a great party pleaser! You’re right — what’s not to love?! I heart PB and chocolate! Drooling. I will definitely be making these. But might have to wait until I’m marathon training again. I will surely eat too many and will need to burn them off! I make them and eat some, then take the rest to work. Because if they sat in my house too long, I’d eat them all too! Why and how are you so thin? These look like a 4 or 5 cookie minimum. OMG! LOL, I definitely indulged in a few! Oh yes, def make these when you aren’t in the training process for a big show! Peanut butter = protein!!! OMG girl, these look to DIE for!!! BTW, you are so gorgeous!! Definitely give them a try, a great flavor combo! oh yes! these are definately to die for!! Oh man, these look sinfully good! What a great combination of flavors. Love them! Oh I hope you get to make them soon! 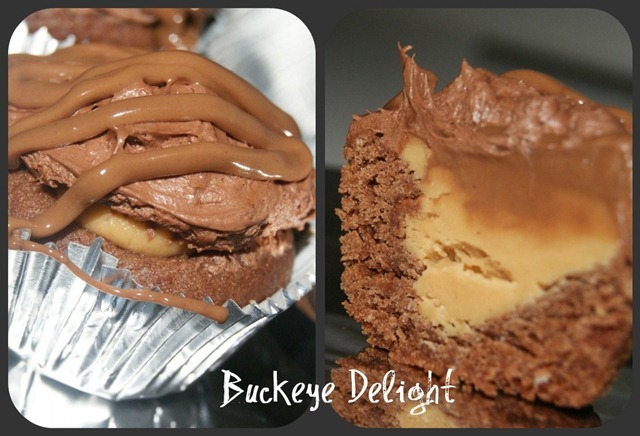 I adore buckeyes and these cute little delights are something I could eat over and over again! Although I’m sure my waist line wouldn’t enjoy that… but hey, you have to indulge once in a while! What a great idea! I love the old fashion buckeyes that my grandma always used to make…and this is like a way cooler updated version. 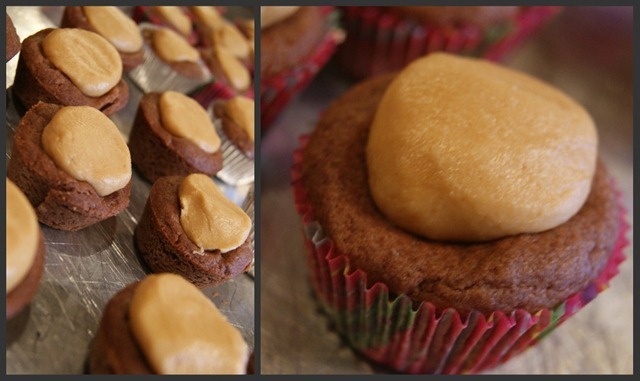 Chocolate & peanut butter…meant to be together! I have never heard of a buckeye before, but yum these look fantastic. I’ll just add them to the list of things to make the next time I have to bring a baked good somewhere. Great idea Kate, they are a party pleaser! Oh my gosh, you are a genius! These flavors are the best all together! 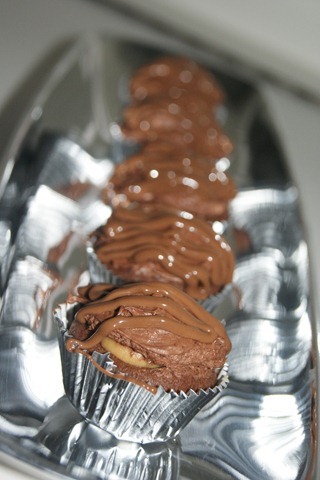 Thanks for visiting:) PB Chocolately goodness! No kidding! You are on to something here. A scratch and sniff screen would be nice too!!! Love love love chocolate + peanut butter! These look so incredibly good! Your a freakin genius! WORDS CANNOT DESCRIBE! I think i just drooled on my keyboard! Better go get a paper towel! Yum Yum! They are wonderful! Wow these look amazing! I think I am going to be forced to make them this weekend. So glad you stopped by my blog and left a comment, I am looking forward to perusing all your recipes! Why thank you! Let me know if you make them and like them as much as I do! Anything with chocolate and peanut butter is the best, but I love how the base is a cookie! Please tell me you own your own shop or sweets catering or something b/c if not, you need to get into that!! Nope, no bakery here. But I’ve been told I should 🙂 I wouldn’t want the headache of being a small business owner though. Oh my gosh! I could do some major damage with these babies! I LOVE buckeyes! Great pics…the shot showing the middle is seriously making me drool! 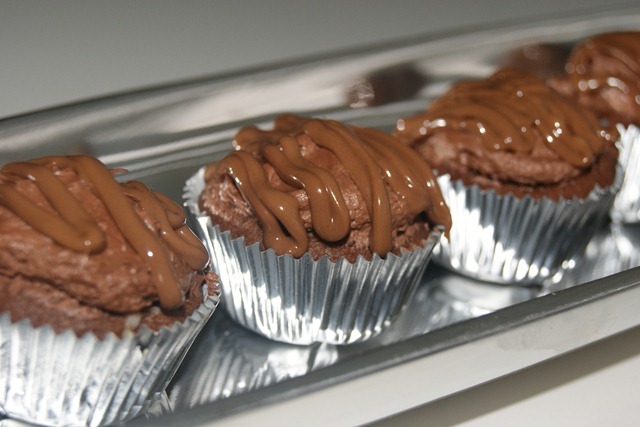 Makes me drool just looking at the pictures again, need to bake ASAP! WOW. I need to make this soon! Yes you do, these are sinfully good. Like a party in your mouth! The *frosting* is called ganache. I ususally bring the cream to a boil, remove from heat and stir in the the chocolate chips. Then I set the pan in the freezer while I make the cookies and the pb filling. Every now and then, I give the ganache a stir. Sometimes it doesn’t thicken up for me either, so I beat it a little and then it thickens up. You could also melt more chocolate chips and stir them in. I’m glad you like these so much because I actually wrote the recipe for Betty :o) and won as a finalist. Even though Betty says they take 2 hours and 40 minutes, I can have the whole batch done in an hour (I guess I’m a good multi-tasker). Your pictures are great! Great job in making up the recipe, I love those things!